Here I am on Gracie on our first ride together. This is why I've been breaking all the "good blogging" rules and not posting on thecomputer. We've been playing hooky from the electronics life. Sorry, Facebook& blogging. You'll have to wait. 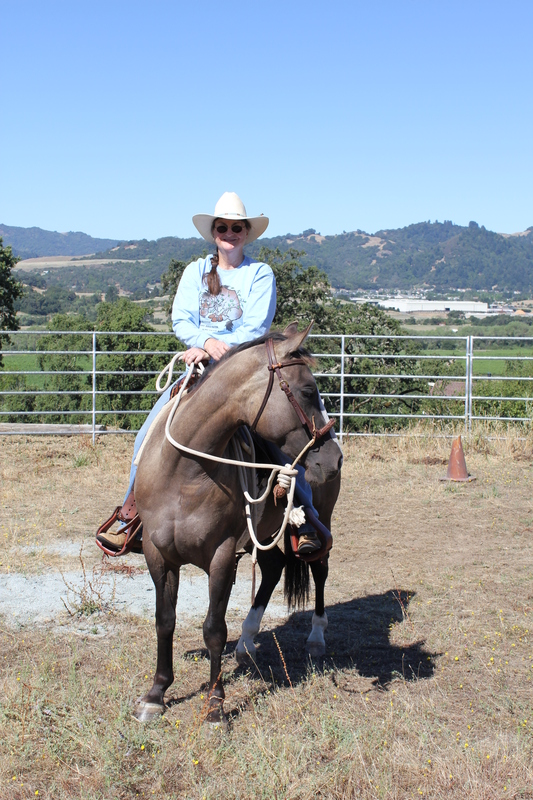 This entry was posted in authors, California Writers Club, farming, great stories, Horses, Kids' stories, Ponies, pony, riding, Sonoma County, Writers, writing. Bookmark the permalink. Thanks, Jennifer! There’s plenty of time in the winter to sit at the computer. Oh, the life of a real cowgirl! Have a refreshing time, Robin, and come back to the computer when you are ready! Am slowly getting back on the computer. Was great to take a long break. Thanks, Arletta! Thanks for the heads-up on the grammar catch! You nailed it! It’s fixed now, except for some spacing issues. Keep playing hookey while the weather’s good. Gracie looks like she’s loving it. Thanks, Jeanne! Yes, she loves attention. Good looking horse! Many times I’ve thought I’d much rather be playing hooky on a horse than looking at my monitor and keyboard! Thanks, Sandy! Yes, she’s a cutie. She’s learning to be a trail horse now on our neighbor’s 200+ acres while she follows Willa around.